Metric model 711MF uses the same parts as inch model 711F and 711H, except for the dials. For more info on the Last Word indicator see page 117. 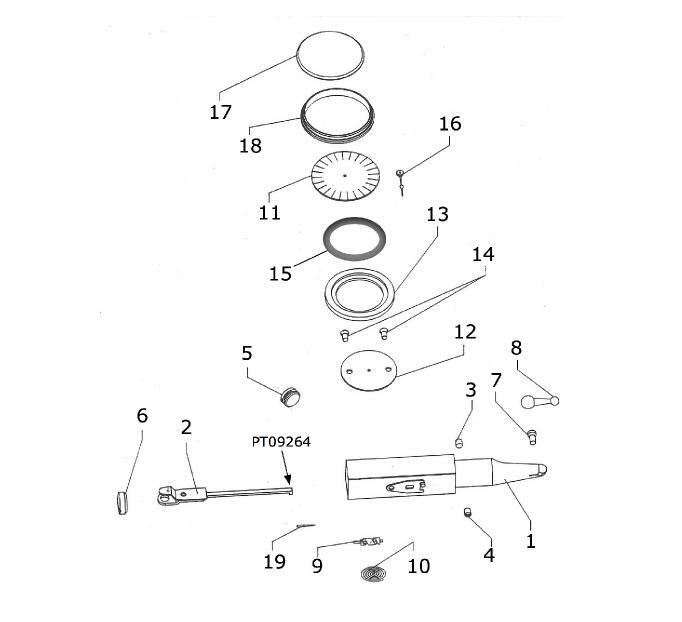 Starrett 711 Last Word Indicator Repair Manual is now available. Refer to page 199 for complete details. Some parts will only be sold while supply lasts. We plan to discontinue carrying Starrett parts within the next year. Contact Starrett for a distributor (we are not distributors) in your area or check the Starrett web site for information on spare parts sales. The spare parts list on this page is for reference only. These parts are not suitable for any Starrett indicator made in China. chrome contact point* Ø .120"
chrome contact point* Ø .062"
chrome contact point* Ø .035"
carbide contact point* Ø .035"
* we also provide other diameters and carbide points. See our contact points on page 21. It's quite common that Starrett parts need to be customized before they fit. You would think that a company which produces precision tools would have the means to manufacture interchangeable parts, but they don't. The lever is a prime example. In order for the jeweled tip to engage properly in the screw gear you may have to bend the lever. Do this with utmost care, since it will break easily. We will not replace the lever if you break it! In a surprise move, quite out of character for the LS Starrett Company, the reversing lever on the side of the indicator body is no longer sold as a spare part. It can only be gotten as part of the complete body. The old levers had a pin that kept them in place; these parts are, alas, no longer available either. In the case of the pin, you can probably find a substitute in your scrap box. For the rest, you'll have to improvise or buy a new indicator. Yes, your Starrett Last Word .001" indicator can be converted to a .0005" indicator by simply changing the dial. No other parts are involved. Unfortunately it's a tricky maneuver which needs a hand lifting tool and familiarity with the workings of this gage but any repair shop, us included, can take care of it for you. We'll charge a simple $55 to do this, parts, labor and shipping included, assuming the indicator does not need any other repair work. The dials of recent models can be damaged by prologed exposure to solvents. When cleaning them, do not let them soak for more than a minute or two or the print will begin to flake off. Item 3 and Item 4: do not remove these screws. There is no need to touch them in most cases. The adjusting screw can be used to change the amount of hand travel. Ideally, the hand should go around just once, exactly. The adjusting screw may be hard to turn. Don't bother ruining a screw driver blade. If it is over or under by a few graduations, this isn't going to be calamitous. Item 16: when installed, the hand (pointer) will be at the six o'clock position and it will make exactly one revolution. Two adjustment screws are available for this purpose. If the hand travels much more than one revolution, it will probably cause the hair spring to tangle. Item 17: Last Word crystals are easily replaced. You will need a flat blade screw driver to pry off the knurled chrome bezel. You can then remove the old crystal. If it is very old, you will also see a split ring spring which you can now toss away. The new crystal fits right in and you can press the chrome bezel back in place. A small pair of nippers can help get a snug fit but be careful you don't ruin the new crystal in the process. It should be mentioned that obsolete model 711-T1 (.0001") used a different crystal, which we no longer supply. For more information on do-it-yourself repairs, take a look at page 117.